This week our Muse is Michele and she has done a beautiful card that incorporates a range of techniques so lots of choice!!! Plan B... this was to still take inspiration from Michele's circles ,but just to use a couple of punches instead! I tried to follow Michel's colours, dots ( my new DP from MFT ) and gold embossed sentiment from Clearly Besotted. But thanks for taking the time to look it is very much appreciated . Jenni you have done a fantastic job of recreating my balloons with your circle punches! Look at your darling dots! Thank you so much for taking those precious moments to play cards with me at Muse! You'll forgive me if I'm having a giggle about you and your bruised pride, and soggy knickers! Thank goodness you are okay! Ah, I wish I had done that - I feel like there's too many dots on mine - having the dotted panel is the perfect amount! Once again, astounded by how similarly we think! lol! So glad you joined us at Muse this week, Jenni! Beautifully balanced and light CAS take on the inspiration. Love it! Such a beautiful take on Michele's card! I love that you chose flowers for your focal point, and that you created a crisp, clean design! 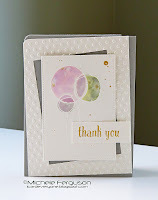 Jenni, love your card ... great take on Michele's ...I really like the dot panel.